Aw, man. 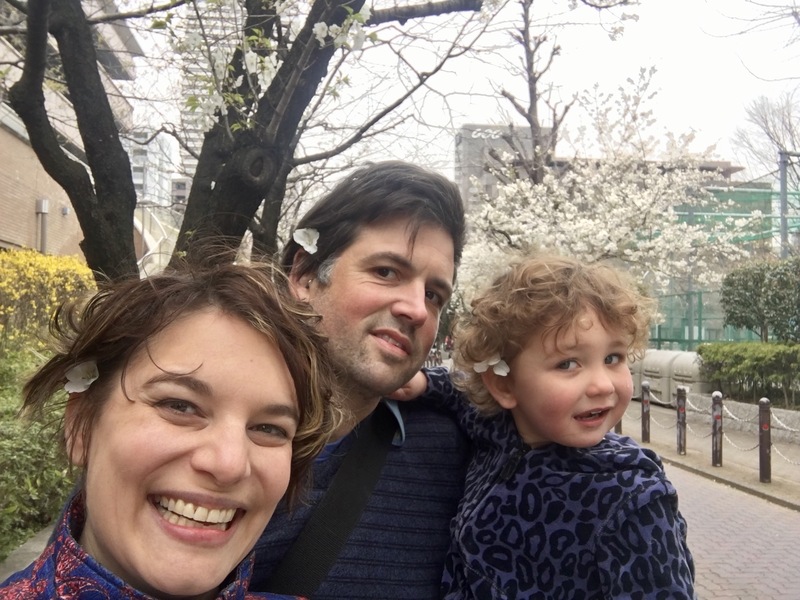 I can’t believe I’m already writing about the last day of our trip to Japan! We need to leave our apartment here near Ginza at about 7:15 tomorrow morning to head to Narita to catch out flight, so tomorrow doesn’t really count as a trip day at all. 7:15 isn’t too far away, either! I should be in bed, like Logan and Ami, but I’m too amped up to sleep. Might as well write down what we did today before it fades! 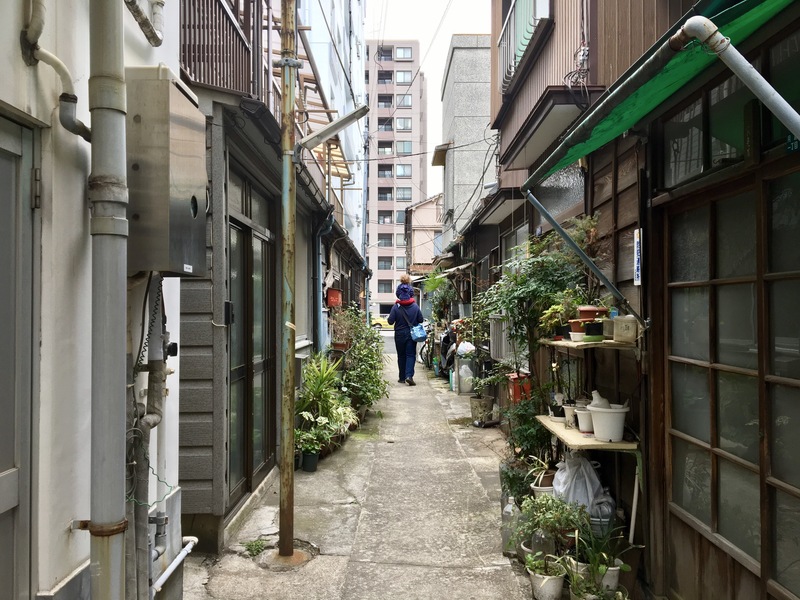 This morning, we headed back to Tsukiji Market. Logan really, really needed (NEEDED) one last sushi breakfast while we were here. 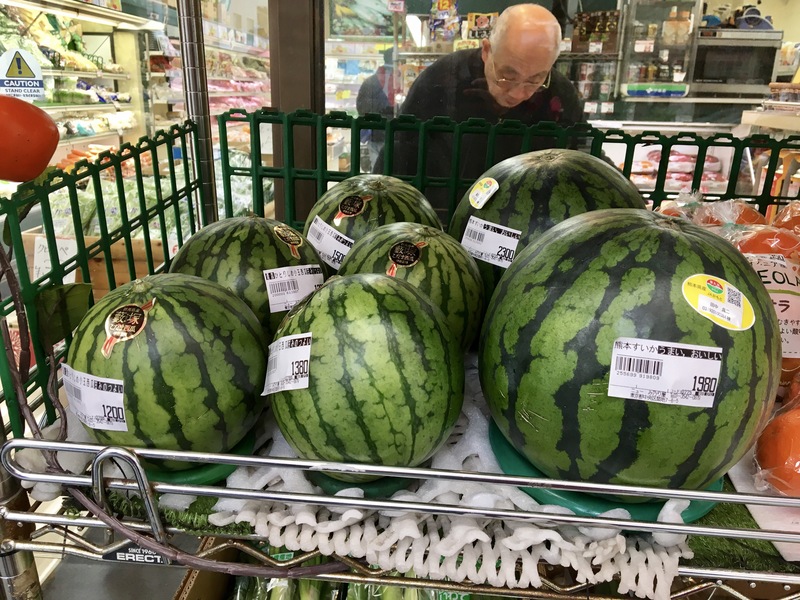 On the way, we bought a $18 melon (no we didn’t). 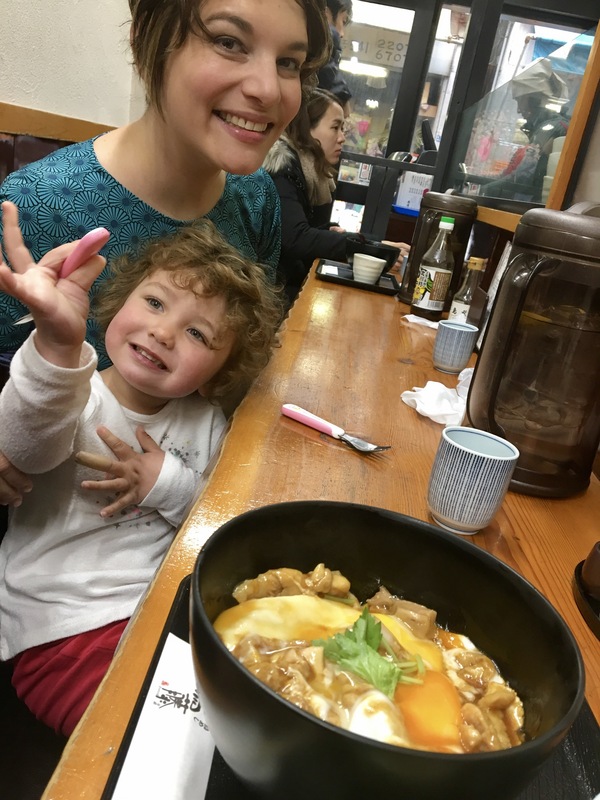 Logan settled on Iwasa for breakfast, in Tsukiji’s outer market. 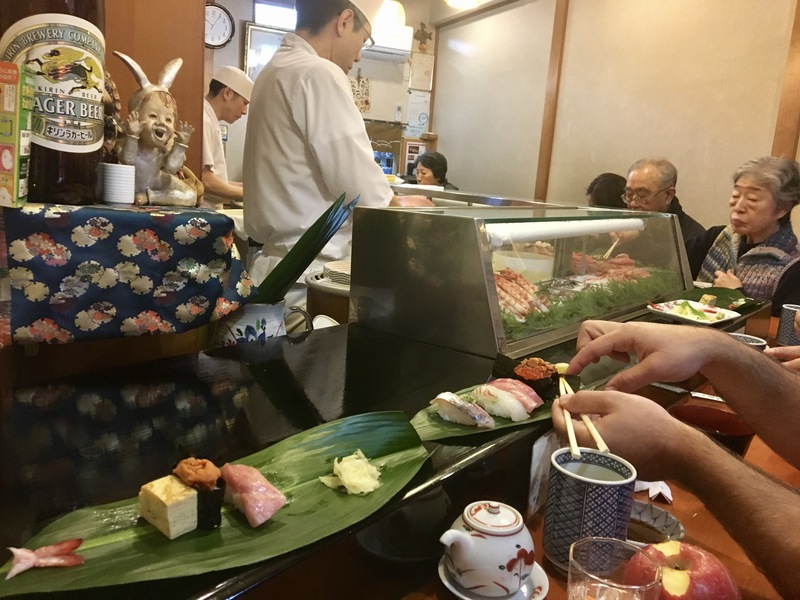 It was very good, though not quite as good as the place we went on our first sushi breakfast foray to Tsukiji (Sushi Yamazaki). This time, though, Ami really got into the salmon roe. I have to say that was a bit surprising. After sushi breakfast, we walked over to rehash one of my favorite meals of the trip, the oyakodon at Toritoh. Though we didn’t have to wait for either of our delicious breakfasts, we did notice that the outer market was WAY more crowded on this visit than it had been on either of our previous trips a few weeks ago. I’m not sure if that’s because there are more tourists in town, or perhaps that it was slightly later in the day? Who knows. The weather this afternoon called for rain, so we wanted to spend as much time outside this morning as we could. 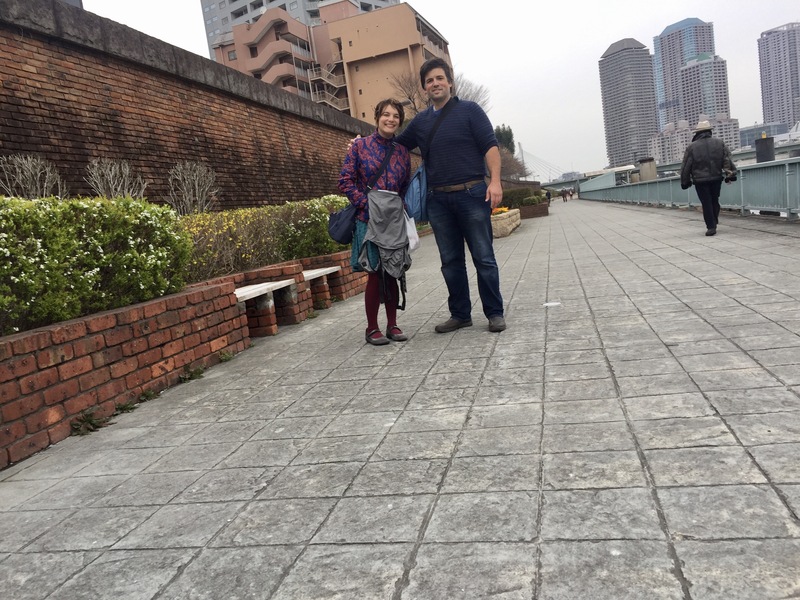 We started walking and crossed the Kachidoki Bridge, heading in the general direction of a 100 yen store to pick up another few souvenirs. 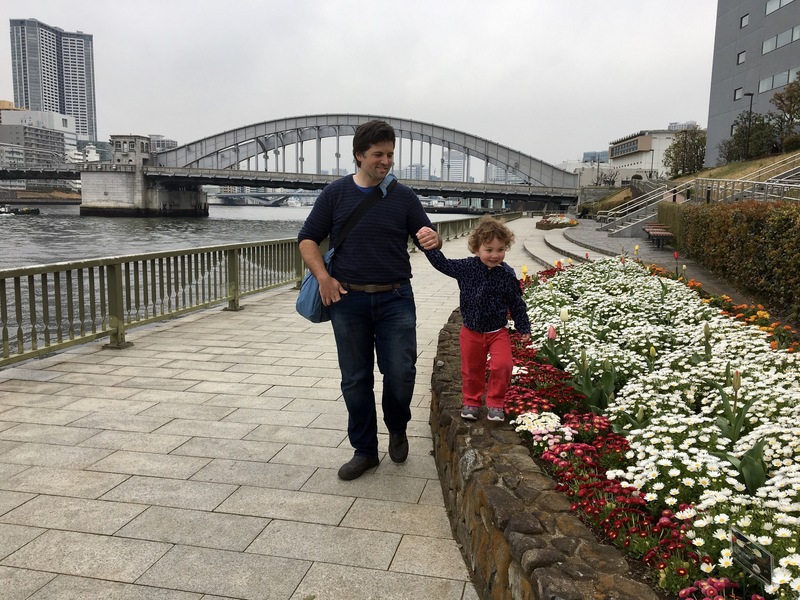 The walk along the river was really quite nice – so many pretty flowers! Ami took a picture of us, too. Maybe she’ll be a shutterbug like her dada. I love wandering in unfamiliar cities. 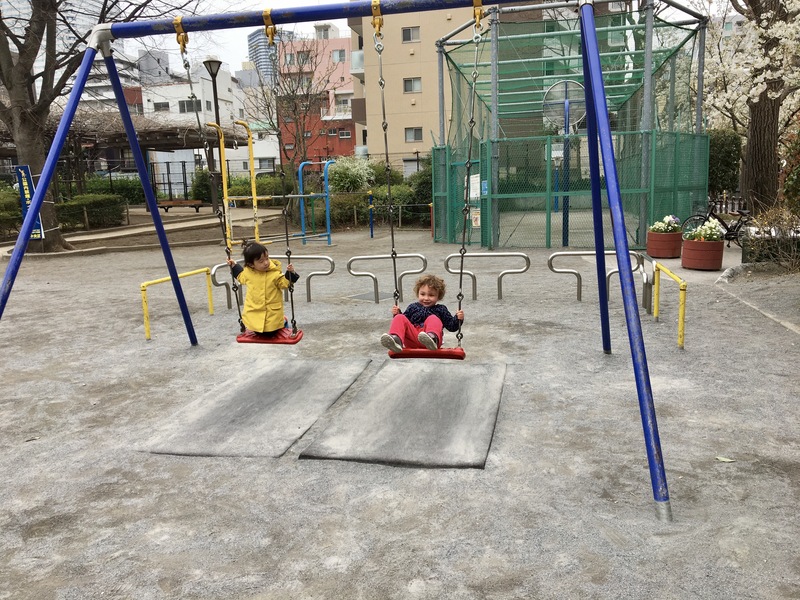 We even found a fun little playground near Tsukushima Station! Ami was really excited to stretch her legs. We did have to crush her dreams a little bit when she wanted to get into the sandbox, though. At least there were lots of other wornderful things to play with. 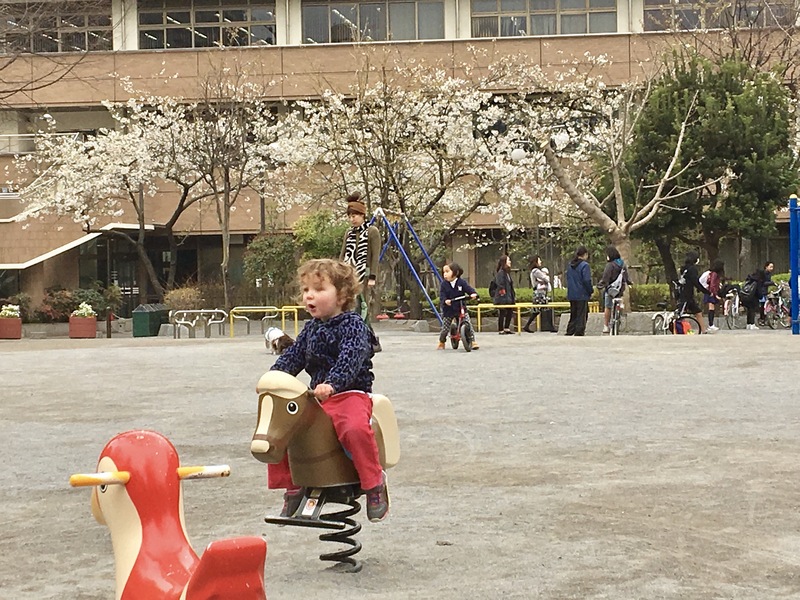 And the park even had some cherry trees starting to bloom! Logan then found us a Daiso 100 yen store, where we managed to spend an awful lot considering just about everything we bought was 100 yen. Fully laden, we hopped a bus headed back in the direction of our house, because we were in search of ice cream! 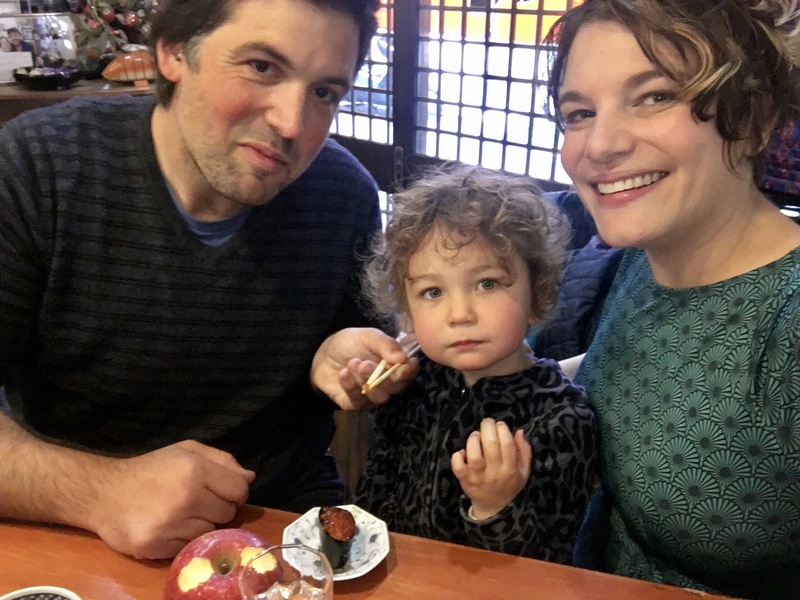 When Jody and Tori were wandering Tokyo on their own in the first few days of the trip, they found a shop selling the specialties of Hokkaido, Japan’s northernmost island. 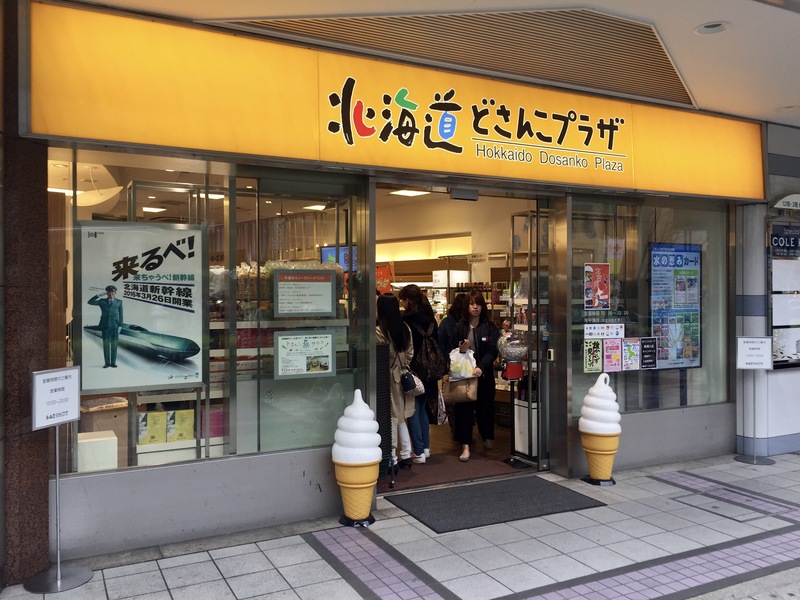 In the back of this shop is a little stand selling soft serve ice cream made from Hokkaido milk. 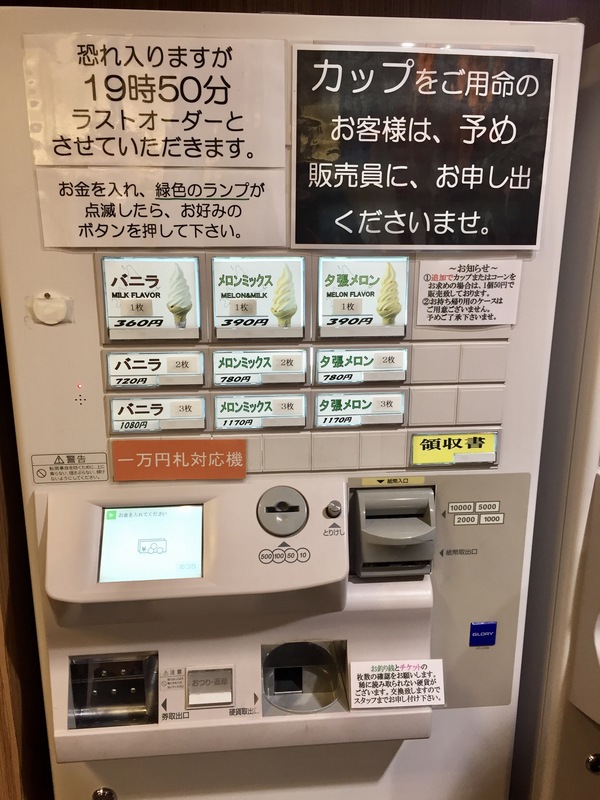 The ice cream comes in two flavors, milk and melon (kind of a cantaloupe flavor). You can also get the two flavors swirled. First, you buy your ticket from a machine next to the stand. Then, you hand it over to the people working the ice cream spigot. Ami chose melon, I chose swirl, and Logan chose milk. This was some wonderful ice cream! Not crazy sweet, but full of flavor, and very very smooth. 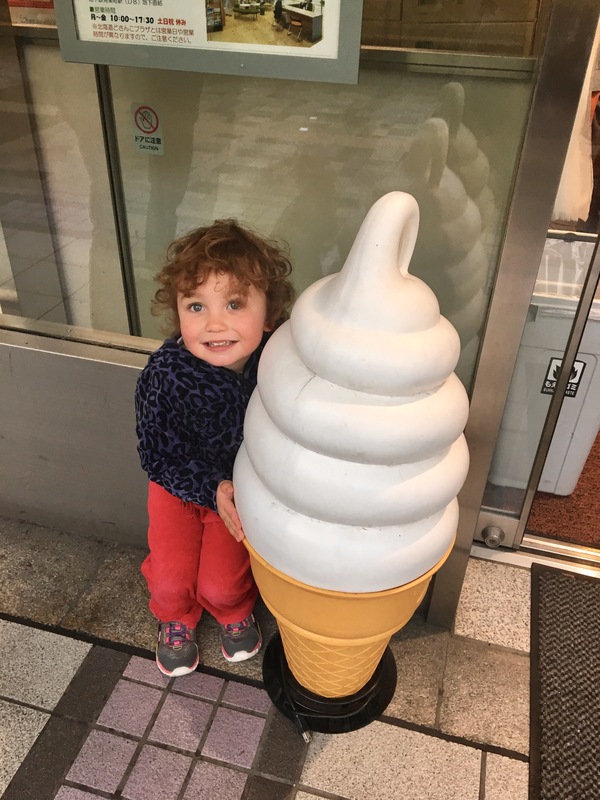 Ami liked it so much she wanted to pose with the big ice cream cone out front. By the time we left the store, it had started to rain outside, so we hopped a cab back to our AirBNB. I took a shower, and Logan and Ami watched a few Peppa Pigs and played some ipad games. It felt really good to take a midday break – we haven’t had one of those in a while! 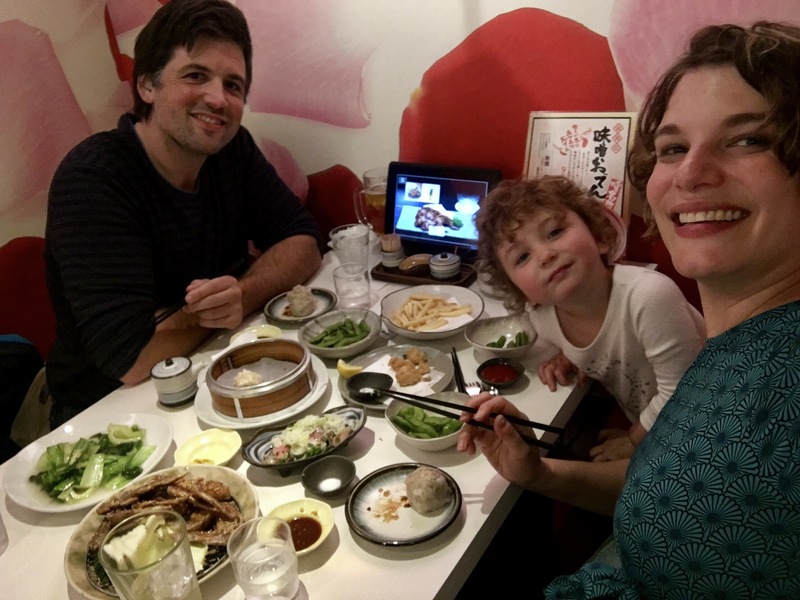 Toriyoshi Shoten Yurakucho’s Hibiya location was perfect, exactly right for our last night in Tokyo. 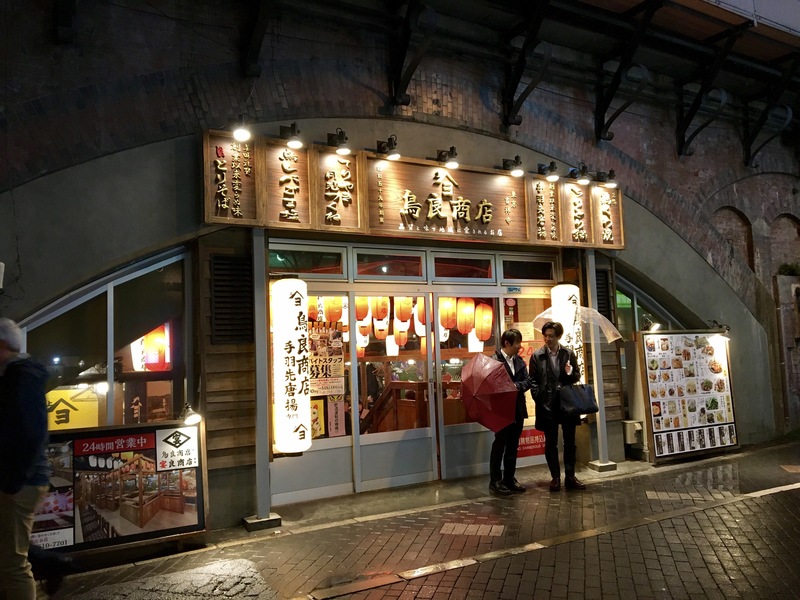 They had edamame and French fries for Ami, as well as fried chicken tails, delicious simmered greens, huge siu mai, gyoza topped with rich chili oil, crispy chicken wings (in hot and sweet), eggplant in a ginger soy sauce, and sliced chicken livers topped with leeks. Then, we caught a cab back to our place! Ami was exhausted by the time we got home, and barely made it through her bath and changing her bandaid before she fell asleep. Logan and I gathered all of our belongings and tried to get set up for the morning. I’m feeling pretty prepared! And now, it’s time for me to go to bed! 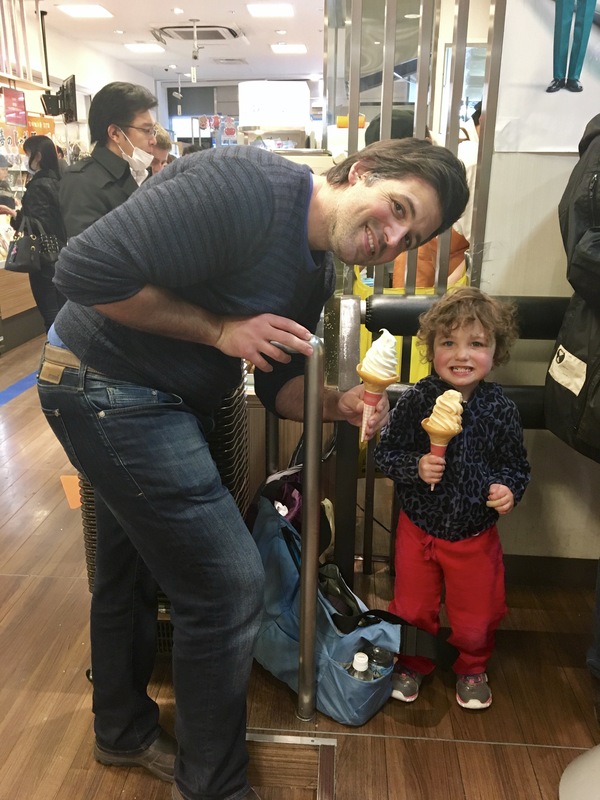 I’m hoping to write a couple more posts after we get home, maybe about what I learned about traveling with my toddler. Please wish us luck on our flight tomorrow, and thank you for reading these posts!